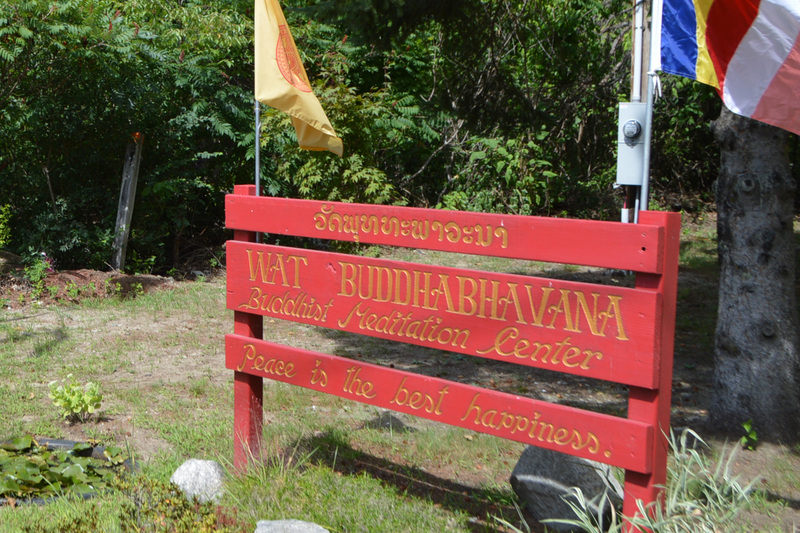 Welcome to Wat Buddhabhavana of Massachusetts! Originally known as The Laotian Temple of Massachusetts, Wat Buddhabhavana was founded in the mid-1990s by a small Lao community in Lowell, Massachusetts. In the early 2000s, due to the illness of the head monk of the temple and his subsequent retirement, the temple’s lay board members considered dissolving the temple. However, board members happened to hear of Venerable Ajahn Mangkone and Venerable Ajahn David Chutiko, two monks who were living in Lowell at the time, and invited them to become the temple’s new religious leaders. Venerable Mangkone and Venerable Chutiko agreed with one stipulation: that the temple’s name be changed from The Laotian Temple of Massachusetts to Wat Buddhabhavana, with hopes to welcome and include all people, regardless of their ethnicity. Under new leadership, Wat Buddhabhavana was revived. By August 2004, Wat Buddhabhavana was established on a 2.20 acre property in Westford, Massachusetts. Lay members and resident monks soon began the process of renovating the old farm house, garage, barn, and horse stable into a Buddhist Meditation Center. The temple is fundraising to continue its construction and hopes to have adequate funds to build an elaborate Lao-style retreat center. to rejoice and pay homage to this outstanding accolade. Please join us in congratulating and celebrating Venerable Ajahn Bouakeo on his acclaimed designation. This event is open to all. 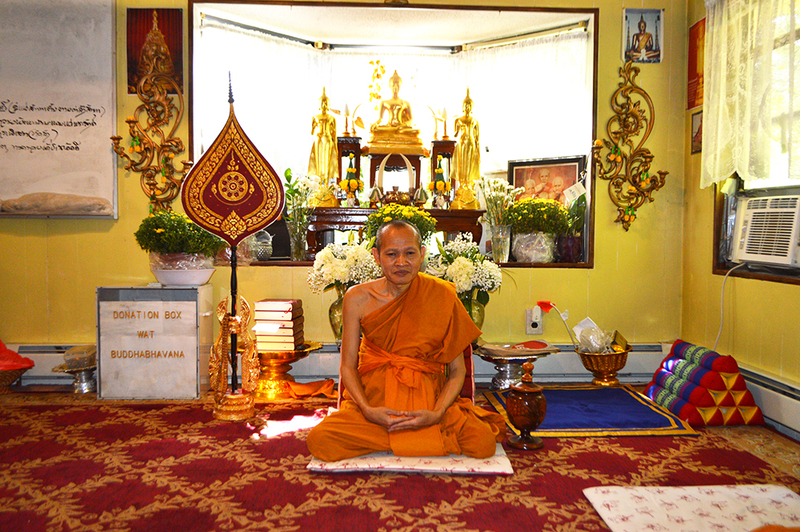 The current Master Abbot is Venerable Ajahn Bouakeo Sengsouriya. He was born in a small beautiful village called Donekoy Village in 1959. Since childhood he often went to the Buddhist monstery with his mother, helping out the monks with Pindapata, or, when the monks go to collect alms. He became very close with the monks and soon started his journey learning about Buddhism meditation and practice. He was ordained as a Buddhist novice at the age of 13 and continued his Dhamma education in Laos. In 1979 he received a higher ordination Upasampada and became a fully ordained Buddhist monk (Bhikkhu). He later graduated from the National University of Sangkhoo in Vientiane, Laos in 1985. Since then he has been teaching and continues to preach the Dhamma in different schools and universities in the country. In 2012 he was invited by the Lao-American community of Lowell, Ma to take residence at Wat Buddhabhavana and he has been the lead abbot ever since. Wat Buddhabhavana is located at the end of Milot road in a quiet, rural part of Westford, Massachusetts where a small farm once stood. With the combined efforts of the monks and lay members of the temple, the property includes two barns that were converted into meditation halls and the main house where the kitchen and restrooms are located. The temple attracts many families with young children who enjoy playing on the playground in the front of the property. The temple has plans to convert another barn into a commercial kitchen and restroom facilities and to develop new living quarters for the monks. The temple members agree that the temple’s grounds and location are idyllic for establishing a Buddhist retreat center. The property lies contiguous to a bird sanctuary and nature preserve. Both of these grounds are open to the public and the monks often greet and chat with bikers and walkers on the path. A picturesque marsh brimming with greenery, flowers, fish, and turtles lie just behind the temple grounds. This area as well as the adjacent stream, public trails, and a historic 140 -year-old stone bridge provide the perfect environment for contemplative walks and meditation. Wat Buddhabhavana hosts regular services and events. Temple members provide daily offerings of food to the resident monks. Wat Buddhabhavana has an annual Summer Cultural School for children, which offers lessons on Buddhism and Lao language and culture. Children receive lessons on Buddhism, Lao language, culture, and dance. Wat Buddhabhavana hopes to host a similar program including Lao musical instrument lessons added to the list of activities. Throughout the year, Wat Buddhabhavana celebrates a number of Buddhist holidays such as the Rains Retreat in the spring. Many of these celebrations act as vital fundraisers for the temple. Other fundraisers include the Lowell Folk Festival and the Southeast Asian Water Festival where the children showcase the dance they had learned all summer. The monks are also often invited to private homes for small blessing ceremonies and other religious services. The monks also involved in the prison ministry at Norfolk State Prison and Fort Devon Federal Prison.